Our popular Classic firmness works well for most users. It is easy to insert and remove and very comfortable to wear. This cup is featured in the standard size range in a beautiful Sapphire blue color. Tired of the hassle, cost, and material waste involved with pads and tampons I decided to purchase my first menstrul cup. After some brief searching, I heard some good things about the Me Luna brand and scooted on over to their website. I found the site straightforward and easy to navigate with helpful info about each product. I'm 21, average build, and have never given birth, so I chose the classic sapphire standard in medium with the ball handle. It fits great! I had no issues with leaking or discomfort. It takes a little adjustment to get the cup in the right spot but it's no big deal and then I can forget about it for the rest of the day. I love not having to carry tampons around with me. The cup seems very well-made and I expect it to last a long long time. Great product! I was using a generic cup that I got free off the internet since I wasn't sure how I was going to like making the switch from tampons to the cup, so free was appealing. After using the generic cup for 6 months, I loved the cup, but something about mine wasn't quite right and tended to leak, thus requiring me to wear a pad, not a fan, so I began looking for a new cup. 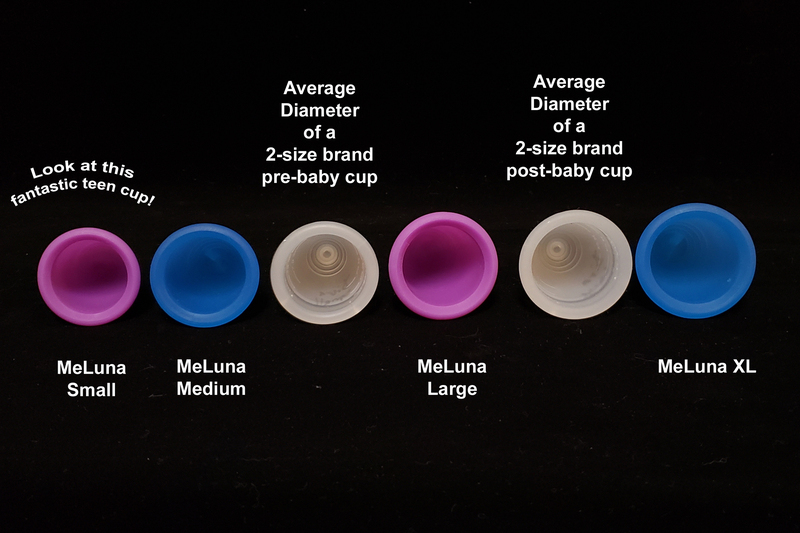 Stumbled upon MeLuna, took the sizing quiz and found the medium standard cup with the ring was the one for me. First time to use it, no leaks, easier to remove with the ring, fit securely without discomfort. I love it! I have recommended it to all my friends and family! I started using meluna as my first cup because of the options with sizing and stem shapes. I’ve been using Meluna for 5 years now, and I will never go back! The size calculator is accurate and I love not having to worry about leaking. This is my first menstrual cup and I love it. I hated using tampons, and when I did research Meluna kept coming up as number 1. So, I followed the steps to figure out which size would be best for me and their guide was spot on. I had no leakage issues. Also, if you are brand new do some research on proper techniques to ensure best comfort. Will never go back to tampons. I wish that these had existed when I was younger. I have hated the faff, and mess of periods all my life and this is an infinitely better solution than tampons. I went for the small; I am 32, no kids, fit and active. It never filled in between changes, although it did leak a little bit during a cardio workout. Maybe I need a medium, or I need to review its placement. Nonetheless, I sleep better with this, I feel clean all the time and I will never go back to using other sanitary products. I may just need to refine size and softness as I get used to the product - hence 4 stars as c.$30 inc shipping it is a large 'guesstimate' investment. If you could buy one get one free on first orders in two adjacent sizes that would be good customer service to solve this issue, and I am sure more potential customers would be willing to give it a go. I would recommend this product to friends. I'm a first time cup user but the website was super helpful on learning which one would work best for me! After taking a little while to adjust to the cup I absolutely love it! So I’m a first time user, super skeptical and a little scared! But I have to say, it’s awesome! I’ve only used it for one cycle and it seems pretty easy! I had a small leak but I realized it’s Bc it didn’t pop open! So far so good! First time user! 28 years old, I love it. I ordered the smallest one and it’s perfect. I bought mine with the little handle , every time I need to remove it it’s not easy to grabbed... I recommend the cup with the ring .